Keynote: Imagine Film Festival today! What: Anne Toole started out as a writer for television and quickly developed towards video games. She has a preference for writing mysteries, horror, fantasy and sci-fi and has produced a large body of work. She worked on big games like The Witcher, Assassins Creed: Origin and Horizon Zero Dawn, as well as writing a lot about writing genre games. In her keynote speech at Imagine she will talk extensively about her area of expertise, with an extra focus on sci-fi. How do you develop a sci-fi world as a writer, what do you pay attention to, how do you work with artists and game designers and what are the pitfalls of the genre? If you didn’t get your game narrative yayas out at GDC and you’ll be at Reboot Develop Blue today, check out the Heroes of Narrative panel. I’ll join the esteemed Chris Avellone and Charles Cecil as we discuss the trials and tribulations of crafting in-game narrative. All attendees will walk away with an idea of where game narrative is, and where it’s going! I also had the opportunity to speak at a panel this Thursday on another panel. Description: Games that tackle serious social issues have the power to inspire players’ empathy by letting them feel the world from the outsider’s standpoint. As the most immersive medium, games also change our everyday lives by impacting economy, storytelling, and culture. Do games have the power to change the world by enhancing empathy amongst the worldwide audience? There mayyyy be write-ups of it online soon! HALO: Lone Wolf comic series concludes today! In her final confrontation with the rogue scientist Dr. Chen, Spartan Linda-058 and her AI companion find themselves in a race against time to end the threat posed by the disenfranchised doctor and evacuate the endangered civilian settlement before Covenant forces overwhelm them all. Thanks to fellow collaborators, who made the book look and feel awesome! 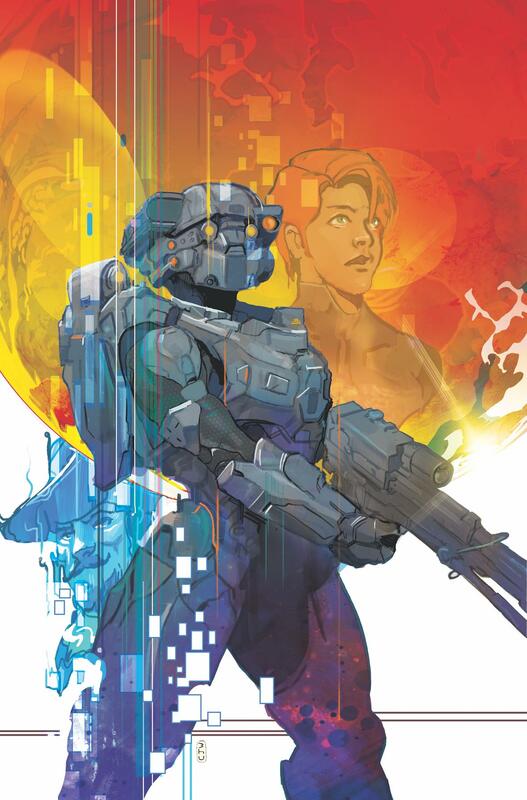 Check out a preview of HALO: Lone Wolf #4, or find it at your local comic shop! Women and comics at Pasadena ArtNight tonight! For International Women’s Day, Pasadena ArtNight will be featuring a host of women comics creators at the Pasadena Library! Come by my table and pick up signed copies of HALO: LONE WOLF, the award-winning MINE! anthology, PET NOIR #5, or any of my Zenescope work while browsing work from a bunch of super talented women. What: Awesome art and comics by women! Kymera Press, Fanbase Press, Kim Dwinnell, Mairghread Scott, Natalie Nourigat, Christie Shinn (HoraTora Studios), Mariah Huehner, Jules Rivera, Susan Lee (Life on Its Side, Women on the Dark Side), Kristen Gorlitz, Xanthe Bouma, Nilah Magruder, Cecil Castellucci, Leslie Hung, Madeline Holly-Rosing (Boston Metaphysical Society), and more! For more information, check out artnightpasadena.org. See you there! NCBD! HALO: Lone Wolf #3 comic out now! The penultimate issue of the HALO: Lone Wolf comic book series comes out today from Dark Horse! If you’ve been reading along, and really, why wouldn’t you?, you’ve been following Spartan sharpshooter Linda-058 as she infiltrates a group of humans who feel abandoned by the UNSC. With Covenant forces closing in on their location, Linda must rally the human settlers under a single essential cause: protect an AI that contains the bulk of human history. Spoilers after the jump. As new threats rise, the legendary supersoldier sees her mission parameters shift and finds that she will need help from the very man she was sent to kill. HALO: Lone Wolf #3 was brought to you by me, Anne Toole (W), and Kieran McKeown (P), JL Straw (I), Dan Jackson (C), Christian Ward (Cover), and your local comics shop! Check out a preview here. Is it just me, or does it somehow seem fitting that a company named Dark Horse is putting out a comic called Lone Wolf? HALO: Lone Wolf #2 comic available! The comic series I wrote for Dark Horse and 343 continues this week with HALO: Lone Wolf #2. If you want to get on board, it’s not too late to pick up a copy or pre-order the rest of the series. Previously, Spartan Linda-058 sets off alone to find a target on a Covenant planet. No spoilers until after the jump! With Dr. Chen, a dangerous ex-ONI scientist, in her sights, Spartan Linda-058 and her AI companion must find a way to end the threat posed by Chen and evacuate the endangered humans in the settlement. But as the Covenant prepare to stage an assault, Linda discovers that Chen holds the key to a secret that could endanger all of humanity if it fell into the wrong hands. Pick it up wherever fine comics are sold! HALO: Lone Wolf comic out today! New year, new comic! If you love you some science fiction set on distant planets, or enjoy the Halo video games, check out Halo: Lone Wolf. I wrote this four-issue comic book series from Dark Horse and 343 that starts with issue one today! You’ll find it wherever fine comics are sold. Halo: Lone Wolf follows Spartan Linda-058 alone on a covert mission. Her skills in infiltration and marksmanship make her perfect for the high-stakes mission to end the threat posed by a wanted scientist on a distant planet. With only an ONI-assigned AI at her side, Linda must fight through both the dregs of the Covenant and the hostility of a lost human settlement to stop the rogue scientist in his tracks. The newest entry in the Halo comics franchise is written by Anne Toole (Horizon Zero Dawn, The Witcher) with art by Kieran McKeown (White Canvas) and JL Straw (Back to the Future), colors by Dan Jackson (Buffy the Vampire Slayer, Call of Duty: Zombies), and covers by Christian Ward (Quantum Age: From the World of Black Hammer, Young Avengers). Want a preview? Preview away here! Enter your email address to subscribe to the mailing list. writingiswriting on Horizon Zero Dawn wins Writers Guild Award! christophervalin on Horizon Zero Dawn wins Writers Guild Award! writingiswriting on Horizon Zero Dawn nominated for Writers Guild Award! christophervalin on Horizon Zero Dawn nominated for Writers Guild Award!